At Autism, Giacomo Vivanti, Aubyn Stahmer have an article titled "Early Intervention for Sutism: Are We prioritizing Feasibility at the Expenses of Effectiveness? A Cautionary Note." In the ASD early intervention field, the concept of sustainability is frequently—and mistakenly—equated with affordability, which refers to the initial costs of training providers and ongoing costs of implementing an evidence-based intervention. Accordingly, while factors promoting sustainment of interventions are under-researched, there is an increasing trend toward reducing intervention costs to make interventions more feasible for use in the community. In ASD, this is often accomplished by decreasing the intensity of an intervention or by lowering specialization standards or training requirements for those delivering the intervention. Three phenomena illustrate this trend: (1) the growing emphasis on low-intensity, parent-mediated early interventions (both in terms of publicly funded programs and new interventions being developed and tested; Nevill et al., 2018); (2) the increased reliance on paraprofessionals with minimal training or supervision to deliver interventions (e.g. behavior technicians who receive 1 week of training overall; Leaf et al., 2017); and, perhaps as a result of (1) and (2), (3) poor adherence to evidence-based practice protocol as providers adapt methods for their own context (Stahmer et al., 2005). 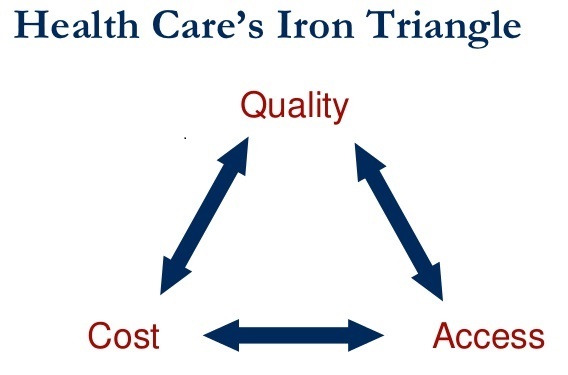 In short, it's the Iron Triangle of health care policy: cost, access, quality. One cannot maximize all three at the same time. There are always tradeoffs.